← How to edit embedded fonts in PDF file by PDF Editor? The application VeryPDF PDF to Word Converter helps you remove graphics from PDF to Word so easily! VeryPDF PDF to Word Converter is able to save you from boring work when converting PDF file to Word of DOC, etc.. With this smart tool, both GUI and CMD operations could be realized instantly. Moreover, this tool is very cheap, which only cost you $39.95, so why not give yourself a chance here to try it? Then, maybe it really fascinate you to buy! By the way, there is one thing you need to know, which is that once you install this software in your computer, CMD version directly belong to you, which you can find in installation folder. Please double-click shortcut of this application, and then, please click hotkey Ctrl + F to open dialog box to add source PDF file with one click on Open, and then, it is finished to add source PDF file. 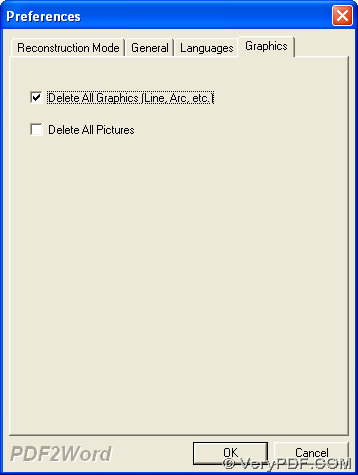 After adding source PDF file, program provides a panel named Preferences on screen, where you need to click tab Graphics, and then, please click check-box Delete All Graphics (Line, Arc, etc.) 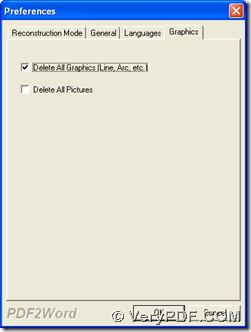 in order to remove graphics from PDF file to Word file later. Then, click OK in order to save setting here for later process. After setting as above, program offers you another dialog box automatically, where please select right folder and click save directly, and then, Word file of DOC without any graphics from PDF file, can be added into targeting folder.